The French Revolution began in 1789 and was fought until 1799. In short, it was an uprising against King Louis XVI in order for the lower class to get out of the oppression they were in, both socially and economically, and to achieve equality between them and the clerics and nobles. So much can be said about the French Revolution, but we really don't have space for all of that information, so I will skip much of the intrigue and solidification of factions and give just the basics of this highly complex event, and hopefully, the reader will be spurred to read more about it. In the mid-1790s, the population of France began to bubble up with the anger and destitution which would allow them to overthrow their government. The battle cry, as it were, was "Liberte, Egalite, Fraternite," which translates into "Liberty, Equality, Fraternity" in English. The middle word in that battle cry, equality, referred to the concept of doing away with the privilege of nobles and the clergy. Those two groups were exempt from most direct taxes, such as property or land taxes, placing the burden of paying for the government's excesses to peasants, merchants, artisans, and professionals, who made up a class called the "Third Estate." And if that didn't economically cripple the peasants sufficiently, they were also responsible for paying dues to the church as well. There were other crushing social and economic inequalities, such as the ancient feudal dues which peasants were burdened with. And there were laws such as that which mandated that although rabbits might destroy the peasant's vegetable garden and prevent him from successfully planting or harvesting his food, he was not allowed to kill the rabbit, because rabbits were protected for the lord to hunt. To make matters worse, when the lord trampled the peasant's crops and fences, or even inadvertently killed his dog during the hunt, the peasant had no method by which he could recoup those losses. Commoners were also excluded from holding high offices in the state, the military, and even the church. While the Church was exempted from paying taxes, it levied a 10% income tax in the form of crops on the Third Estate on the premise that they would use this "tithe" to redistribute the wealth to the poor. The anger and resentment of the populous toward the church caused it to enjoy less power. The Third Estate was beginning to awaken to the fact that their monarchs, who ruled by divine right and ruled over them without them having any representation should have no absolute reign over them. France itself was facing bankruptcy due to the its participation in the American Revolution and the Seven Years War as well as its inefficient tax system. In order to come up with a solution to their fiscal insolvency, the king convened the Estates-General, a group of people from the First Estate (the clergy), the Second Estate (the nobles), and the Third Estate (the commoners), to figure out how to solve the financial problems. The three estates were stalemated, however, with each of them fighting for the powers of their own group. On June 20, the "Tennis Court Oath," was to play a huge part in the French Revolution. The 577 members of the Third Estate at the Estates-General found themselves locked out of a meeting of the Estates-General. On that day, 576 of those 577 who had begun to call themselves the "National Assembly" moved to an indoor tennis court nearby and signed an oath wherein they pledged "not to separate, and to reassemble wherever circumstances require, until the constitution of the kingdom is established." This statement, as you might suspect, was one which was looked upon as an act of revolution by King Louis XVI, who had exercised what he believed to be his divine right of rule unopposed. In an attempt to keep up appearances that he still controlled the Third Estate, he ordered the first clergy and the aristocracy (the first two Estates) to join the National Assembly, legitimizing that body. And the rebellion continued to foment until July 14, when the people of Paris stormed the Bastille, in search of weapons. The peasants and merchants became more and more involved in the rebellion, and on August 4, the peasant insurgency decreed the "abolition of feudalism" and would later declare that the property of the Church would be "at the disposal of the nation". And then, in October, the horrid weather of 1789 caused the price of bread to double, and women began to congregate at the markets of Paris. They marched through the streets, demanding that city officials address their concerns about the economic situation. Furthermore, they demanded that the King stop trying to block the National Assembly and that he move from Versailles to Paris as a symbol of good faith that he was going to try to help alleviate the poverty which had descended upon that city. Feeling ignored, more than 7,000 joined in a march to the palace in Versailles, towing with them cannons and other weapons which they had ransacked from the city armory. Despite the fact that more than 20,000 of La Fayette's National Guardsmen were deployed and tried to keep order, the women stormed the palace, killing several guards in the process. The king finally relented, relocating to Paris on October 6, 1789. In November, the National Assembly enacted social and economic reform which would, among other things, allow them to use the property of the church to back a new currency as well as to take over the responsibilities of the Church including caring for the poor, the orphaned, and the sick and paying the clergy. Legislation was passed which abolished the vows taken by the monks and nuns and abolished all religious orders, sending the clergy back to private life. On June 20, 1791, Louis XVI and his family disguised themselves as servants and fled Paris but were apprehended near the Austrian border within 24 hours. Upon his return, he and his wife, Marie Antoinette, were held under guard by orders of the National Assembly, who also suspended the king. On January 17, 1793, Louis XVI was condemned to death for "conspiracy against the public liberty and the general safety." He was beheaded three days later. As the revolution continued and the economy worsened, people took to the streets, and mob rule was law, with those mobs turning on a dime against those whom they previously held in favor. The Reign of Terror was the brainchild of Maximilien Robespierre, the leader of the so-called Committee of Public Safety, and the result of the political upheaval which ensured after the monarchy was overthrown and France was invaded by foreign powers who wished to fill the vacuum left by the execution of King Louis XVI. 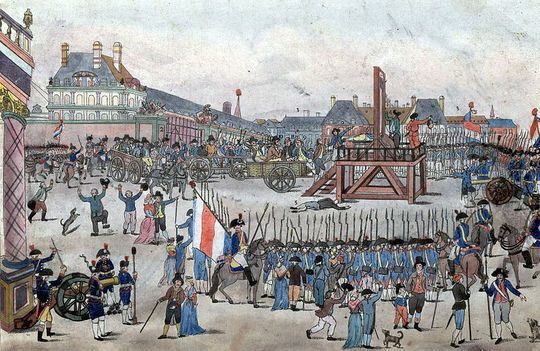 It took place from 1793 to 1794, with records indicating that more than 16,594 people were beheaded by guillotine across the country. "If the spring of popular government in time of peace is virtue, the springs of popular government in revolution are at once virtue and terror: virtue, without which terror is fatal; terror, without which virtue is powerless. Terror is nothing other than justice, prompt, severe, inflexible...It has been said that terror is the principle of despotic government. Does your government therefore resemble despotism? Yes, as the sword that gleams in the hands of the heroes of liberty resembles that with which the henchmen of tyranny are armed." Eight months after her husband's execution, in the early days of the Reign of Terror, Marie Antoinette, was beheaded for the crime of treason to the principles of the revolution. While the Revolutionary Tribunal condemned thousands of people to the guillotine, unruly mobs beat one another to death in the streets. Although the Reign of Terror was meant to stop enemies of the revolution, most of the people who were rounded up and beheaded were not aristocrats at all, but peasants, merchants, and other members of the Third Estate. As with most mob rule, the zealousness took the Tribunal away from its primary mission, and by the end of that reign, people were being put to death for even off-handed comments critical about the revolutionary government. Watch Committees were set up around all of France, and they arrested people "who, by their conduct or their relationships, by their remarks or by their writing, are shown to be partisans of tyranny and federalism and enemies of liberty." Even those who rose in the Convention calling for an end to the Terror were themselves beheaded. Civil liberties were suspended, and insanity ensued. In 1794, Robespierre called for a new purge. At the same time, he implied some threats to other members of the Committee of Public Safety. Robespierre was arrested and sent to the guillotine the next day, the last victim of his own Reign of Terror. Presents a brief account of the French Revolution, Lafayette, and access to numerous Medieval and Renaissance manuscripts as well as those which add to the coverage of the period of restoration. Detailed account of the Revolution in France, what the French wanted in the first place, and the economic woes which hit the national treasury at the dawn of the war. Shares topical essays, images, text documents, maps, and a timeline about the French Revolution as well as a link for those who wish to buy a book and CD on the same topic. Beginning with details about the economic crisis which preceded the French Revolution, this site goes on to follow along with the taking of the Bastille, the feelings of the peasants toward Marie Antoinette, and other important causes of the war. Contains a summary of the war and its causes, analysis of the National Assembly and the Reign of Terror and suggestions for further reading. Search for French Revolution on Google, Bing, or Yahoo!